It’s a question we’ve all had at some point in our wellness journey: Can I have a drink every once in a while and still stay fit? Will that night out inhibit all of the progress I’ve been making at the gym and with my diet? It should come as no surprise that this issue is far from black and white, as there are a multitude of factors involved. With that said, the truth is that you can, in fact, drink alcohol without derailing your fitness goals. The truth about alcohol and your metabolism. First, let’s break down what alcohol does to you from a biological standpoint. Alcohol has long been demonized as a muscle inhibitor, as it blocks the absorption of nutrients to the parts of your body that need them. 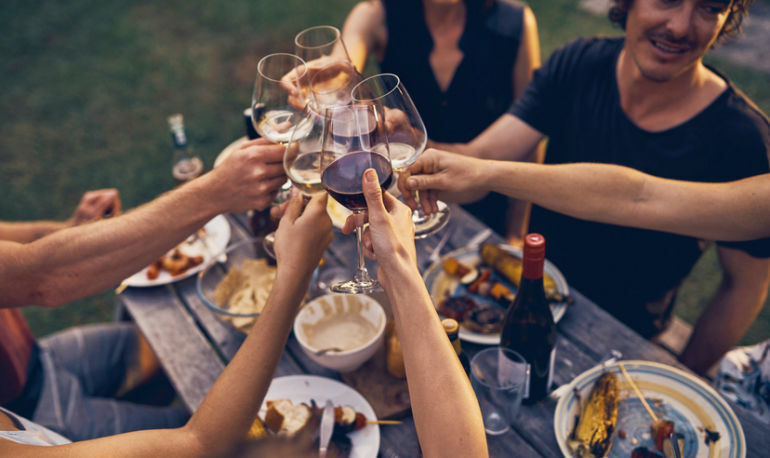 When you drink, your body essentially puts all the other foods you’ve consumed on the back-burner, and devotes itself to metabolizing the alcohol first. This is because unlike carbs, protein, and fat, your body isn’t equipped with a storage capacity for alcohol, so when you drink, getting it out of your system is your body’s immediate priority. This process happens rather quickly (unless you’re really hitting the bottle), so this delay of nutrient absorption is actually pretty overblown. You also may be wondering why some of your friends can drink like Keith Richards and still remain thin. That’s because alcohol has a higher metabolic rate than food, meaning you actually burn more calories processing it than you do anything else. But wait: Here’s why it’s about more than just alcohol. So far so good, right? Alcohol increases your metabolism and is out of your system quickly? Before you hit the bar, though, it should be noted that alcohol can deter your fitness goals, not because of its chemical makeup but rather the vehicle that carries it (beer, wine, etc.). It’s no secret that alcohol lowers your inhibitions and impairs your ability to make rational decisions. The most dangerous effect that drinking can have on getting in shape is not the alcohol itself but the intoxication that comes with it. It’s an all-too-familiar story: You spend all week carefully monitoring your diet and making good choices, and come Friday night you go out for a few drinks and next thing you know you’re going face-first into a plate of french fries (so long, diet). And lest we forget, alcohol itself does contain calories (7 per gram, which is less than fat but more than carbs and protein). A shot of clear liquor will run you about 80 to 90 calories on average, while fruity drinks or heavy beers like IPAs can exceed 200 (healthy cocktails do exist though. Here’s how to make them. Yes, you can drink alcohol without it encroaching on your fitness goals. As we’ve all experienced, a night of drinking can profoundly affect your activity the next day. Going to the gym while hung over is a displeasure I wouldn’t wish on my worst enemy. You’re dehydrated, lethargic, and overall just lacking the motivation necessary for anything that can’t be done from your couch. In the end, alcohol isn’t necessarily the problem—drunk (and hung over) you is the problem. All of these negative effects are only exacerbated the more you drink, so as long as you’re doing it mindfully and controlling your intake, there’s no reason you can’t toss a few back every now and then.